With 36 years’ upholstery experience, including discerning clients in London’s West End and English country houses, manors and mansions, James Backhouse is an outstanding craftsman. Antique furniture reupholstery is James’ passion, and he is skilled in techniques that few other upholsterers are able to offer. You can read more about James Backhouse here. James Backhouse is skilled in antique furniture reupholstery. Antique furniture reupholstery is about more than just replacing the fabric: JBU Limited organises for the woodwork to be restored, if needed. And then any original horse hair padding is washed and brushed to rejuvenate it. Pattern matching is an important upholstery skill - especially when working with antique furniture. Modern, quality furniture pieces also benefit from James Backhouse’s craftsmanship in upholstery. No matter what kind of look and ambience you wish to create, JBU Ltd can upholster your furniture to suit. Custom made headboards give your bedroom a luxurious and totally unique look. You can expect a very thorough job from JBU: once the furniture is stripped down, we'll look at the springs and framework and arrange the repairs. And when it comes to re-covering the furniture, the fabric is carefully pattern-matched to ensure that it all lines up properly. James Backhouse’s attention to detail, pride in his work and perfectionism means that your cherished pieces will look better than new. Contact JBU to give your favourite furniture a new lease of life. Chair upholstery is a great way to give your furniture a new lease of life. How does the upholstery process work? 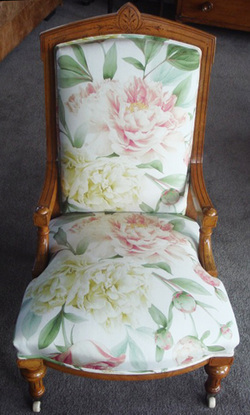 Email us (james@jbu.co.nz) a photograph of the item you’d like upholstered, and some details of the type of work you’d like done. You'll then receive a written estimate via email for the work. We can direct you to recommended fabric houses in Auckland where you can select your upholstery fabric – or else you’re welcome to supply your own fabric. Once you’ve approved our estimate, we'll arrange the furniture to be picked up from your home. JBU will then purchase the fabric on your behalf, to make sure that the quantity is correct. The upholstery work begins - and if we spot any problems, such as broken springs, now's a good time to get that fixed too. JBU can organise it all on your behalf, as we have trusted and reliable suppliers who will do this work to meet your high standards. When the furniture is ready, JBU will deliver it back to your home. Bring your favourite furniture back to life! For a free, no obligation estimate, email us a photo of the furniture you’d like an estimate to james@jbu.co.nz. Please include details of the work you’d like done.